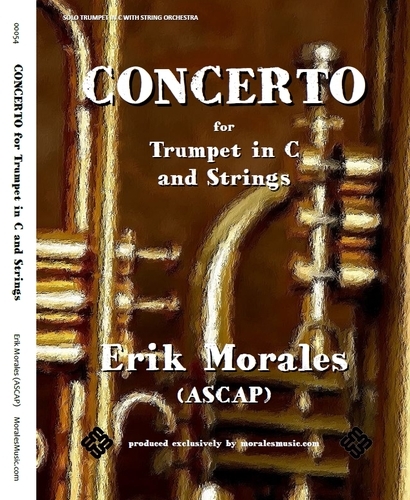 Welcome to the official website of composer Erik Morales! • Coming Soon! MoralesMusic.com is teaming up with BLACKBINDER music reading app. Soon your music purchase will automatically come with a electronic version that can be used in the BLACKBINDER app for Apple iPads. BLACKBINDER is the ultimate sheet music reader! You should check them out here: www.blackbinder.net or get it in the App Store. This concerto is an adaptation of a three movement work that was originally conceived as a showcase for trumpet in C and piano. Through the years I've had several requests to create a version with string orchestra. This version adapts the original piano part to the string orchestra thereby eliminating the need for piano. This version comes with a PDF Parts CD, printed full score and solo part. The score and solo parts are formatted 9"x12" and spine stapled. The work is an eclectic mix of rhythmic and stylistic elements which have played a major role in my development as a composer. The first movement, “Moderately Fast”, immediately showcases the technical demands for all instruments yet manages to remain light in character. There is certainly a jazz element that is a product of my love for the local music scene here in New Orleans, Louisiana. The initial introduction is a recurring theme that acts as a musical “waypoint” within each movement. The second movement, “Like an Anthem”, is a slow movement and displays an unmistakable early Romantic period sound. The main melody is supported by a cascading chord structure in the Basses and Cellos. The trumpet culminates this movement with an amazing cascade of its own and subsides to a very lush and musically appropriate cadence. The final movement, “As Before, but slightly more intense”, takes on a more menacing and modern approach. This movement is a musical roller coaster ride with characteristic calm and frantic moments. Finally, the trumpet is given an opportunity to showcase its' virtuosity with a lengthy section of light and fast double-tongue technique. Copyright © 2017 Erik Morales. All Rights Reserved.